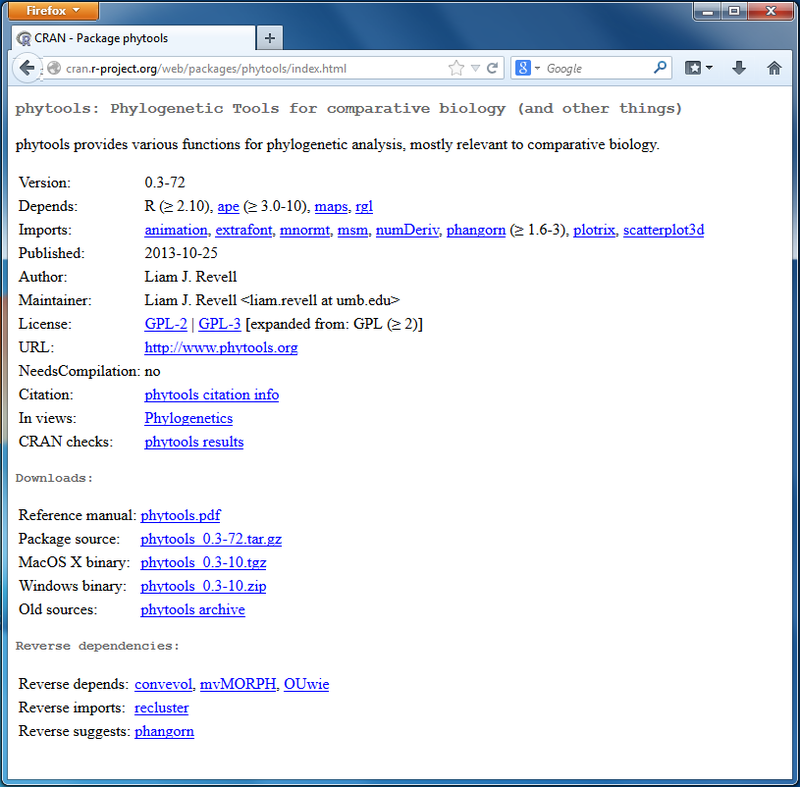 A new version of phytools (phytools 0.3-72) is now on CRAN. It's been a few months since the previous CRAN version. This is partly because I had to do some work on the minor phytools versions that I've been posting to bring them into compliance with changing CRAN standards. For instance, CRAN now encourages functions that are used in package dependencies to also be imported using importFrom in the NAMESPACE file, and foreign function calls to compiled C code in other packages are no longer generally permitted (or, at least, they are actively discouraged). 1. An update to phyl.cca that results when spectral decomposition produces slightly negative eigenvalues (due to limitations on numerical precision) for a positive semi-definite covariance matrix. 2. An update to densityMap to allow users to plot the variation among stochastic maps. 3. A new function (phylo.to.map, and S3 plotting method) to visual a phylogeny connected to or projected onto a geographic map (1, 2, 3). 4. A new version of mergeMappedStates to merge two or more mapped states on a stochastic map tree. 5. A new function (drop.leaves) to strip all the leaves off of a phylogenetic tree. 6. A new version of ancThresh (for ancestral character estimation under the threshold model) which also permits us to fit an OU model for the evolution of liability on the tree. 7. Major updates to the innards of the important phytools plotting function plotSimmap. 8. An update to plotSimmap(...,type="fan") to permit node labels. 9. A new 'static' plotting method for phylomorphospace3d. 10. A new version of plotTree that will supply branch lengths using compute.brlen in 'ape' if none are provided. 11. An update to bmPlot(...,type="threshold") which also maps the (discrete generation) history of a threshold character on the branches of a phylogeny & returns this tree to the user. 12. A new function (map.to.singleton) that converts a tree with a mapped character to a tree with singleton nodes; and a new plotting method (plotTree.singletons) for plotting these trees. 13. A new version of contMap (and, in fact, densityMap) to allow users to plot left-facing trees. 14. A simple DNA evolution simulator (genSeq) that wraps around sim.history (1, 2). 15. A new version of pbtree that allows user-defined tip labels. 16. A new set of methods to plot a backbone phylogeny with triangles as subtrees (1, 2, 3). 17. A new function (multiRF) for computing all pairwise Robinson-Foulds distances for a set of trees that recycles internals to be slightly speedier (1, 2). 18. Additional minor updates to branching.diffusion, xkcdTree, anc.trend, phylomorphospace3d, strahlerNumber, and map.to.singleton. 19. Minor updates to the documentation of various functions. In addition to these changes, and as I alluded above, I made a bunch of additional updates (that will generally be hidden to the user) to the way phytools depends on other packages. I did this primarily to bring phytools into compliance with evolving CRAN standards. 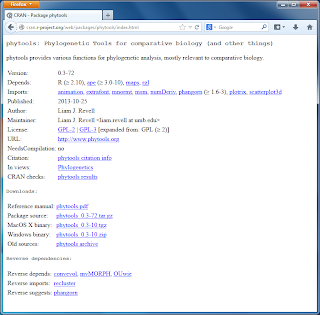 Hopefully none of these changes affect phytools users adversely. Obviously, keep in mind that it may take a few days for Mac & Windows phytools binaries to be build & for the updated version of phytools to percolate through all the CRAN mirrors.